One hundred years have passed since the end of the Great War, the War to End all Wars, the conflict that helped shape world history ever since its occurrence. It is perhaps not a coincidence that at this time, when all of those who fought in that war are dead and gone, the lessons of that conflict are most prescient. Now, as then, the world feels a bit like a powder keg ready to explode, and considering how horrific a world war was then, we can only imagine a similar global conflict occurring today. In the simplest sense, Peter Jackson presents the past as it was. 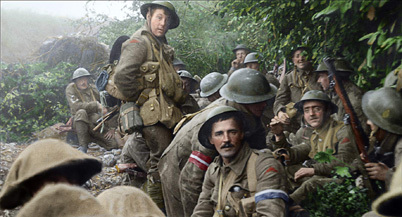 His new documentary, They Shall Not Grow Old, takes old black and white footage filmed during the war, and adds depth and nuance to it to show modern audiences. While none of this is strictly necessary, and might appear at first as a gimmick (the film becomes colorized, widescreen, 3D, and has sound and voices added to the mix), the message is clear by the end. This is a conflict we would do well to remember, and if the only way to attract a modern audience is with these new digital tools, then so be it. The film is presented by Jackson, with a short message at the front, and a longer video at the end. I hope it is always shown with these bookends, as they offer extra depth as to why this film was made the way it was, beyond being the centenary of the war’s end. Although it is a bit odd to see Jackson, a barefoot Kiwi, who we know most for his fantasy films, showing his typical hearty exuberance for a documentary about such a sobering conflict, his passion is truly sincere. Not only were his relatives in the war, not all unscathed, but he also has been fascinated with this slightly forgotten war since childhood, collecting magazines, uniforms and even actual artillery pieces from the conflict. It actually seems that Jackson was the perfect person to bring this conflict to contemporary audiences, given his mixture of enthusiasm and reverence, as well as access to all this material he happened to have, and a large post-production facility that is world renowned. All of this ensures that Jackson treats the material as respectfully as he did Tolkien’s works, so that he really does strive as honestly as possible to put us in the moment when the footage was filmed. While the effort is not perfect, given the source material, the effects do gradually fall into the background, and you just see the war.